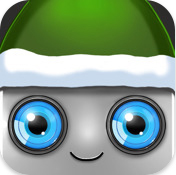 Elf Command iPhone App Review. In the spirit of the holiday season, I decided to try out a fun relaxing game, and step out a bit from the puzzle-mania trance I'm still fighting with. It's actually quite difficult to get a hold of games that work for and not against the user, games that are simple, easy to play and have a certain doze of addiction embedded in them. Alas, the other day I came across Elf Command, which I am happy to say scores high in all those categories. The premise of the game is quite simple. Santa needs your help, his robot elfs can't quite handle the workload, so it's up to you to help them sort out the presents and have them delivered to their rightful, future owners: all the good little boys and girls. 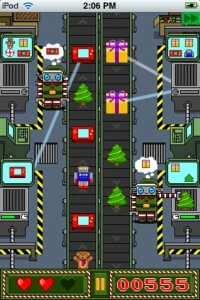 I picked up on the controls and basics in seconds and off I was delivering those presents. 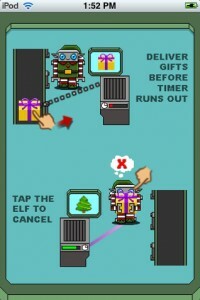 The game presents you with two delivery lines and two elves. Presents come and go on those lines and you have to have one elf or another pick up a present and drop it in the designated delivery zone. To do this, simply tap the specific item and direct it from the conveyor belt to the appropiate dock. A dotted line will assist you in that move, and once you let go of the tap, the elf robot will move, pick up the present from the conveyor belt and drop it off. The game seems simple enough, but with two conveyor belts each moving in different directions, two robots to control and adding the element of time to the equation, and it really does get more difficult to play. To add to the mix, once you've managed to stay long enough in the game, difficulty is increased by introducing the need for more than just one gift for one dock. Once you drop one present on the dock, that dock will require another type of present, so you would need to pay attention to those changing icons as well. My tip: refrain from delivering consecutive presents onto the same dock without waiting to see the next icon appear clearly. Miss more than three presents and you're out of a job. What do you want? Misplacing presents is not an option. Would you like a Barby doll instead of an Action Man figure? To get ahead, you need to be able to split your attention between the two sides of the screen. And here is my advice here. Elf Command can be a fun game to play in two. One of you can handle one side of the screen, the other one can manipulate the other little robot. Chances are you're going to score higher, and definitely have more fun with it. 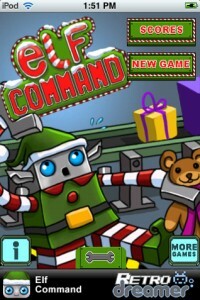 For a no-brainer that's free, simple and fun around the hectic holidays, Elf Command is a clear-cut winner. What do you think of Elf Command ? Scroll down for our comment section and let us know!.